Wolfgang Finger whose friends call him Wolf, was born in East Germany in 1946. At the age of Four, he and his family escaped to West Germany. He later immigrated to the United States in 1957. Wolf is a man skilled in many things. He is a stone mason, artist, stained glass designer and finally, a wood carver. Although he is an expert in each of these endeavors, in this treatise we are primarily interested in his skill as a woodcarver. To understand the whole man, however, I think it is necessary to briefly look at his other fields of expertise. At the tender age of 7 he was already showing a leaning toward art as he created small clay figures of nursery rhyme characters which were exhibited in the school hallways. Not yet into the use of paint and brush, he created his characters by the use of various colored clays. As he reached his teens he had acquired skill in painting and cartooning. Some years later his cartooning was improved by a mail order course and residency course at an institute of fine arts in Philadelphia. He has had cartoons published in local papers. Wolf accepted an invitation of a carving friend to attend a wood carving show. He couldn’t believe what he saw. As he left the show he had several bird carving blanks clutched in his hands and a sense of adventure in his heart. He chose bird carving because he always felt close to nature and lived in the country most of his life. He has spent a great deal of time in the woods studying birds, observing them close up to become familiar with their feathering and coloring. His miniature birds have been described as exquisite. A recent Banded King Fischer took a first place and a grey Falcon took second place in the prestigious Ward Foundation World Competition Show at Ocean City, Maryland. His latest project is two miniature whooping cranes executing their mating dance. Although he has accomplished many things, Wolf’s nature is not to get into a rut but to accept new challenges. 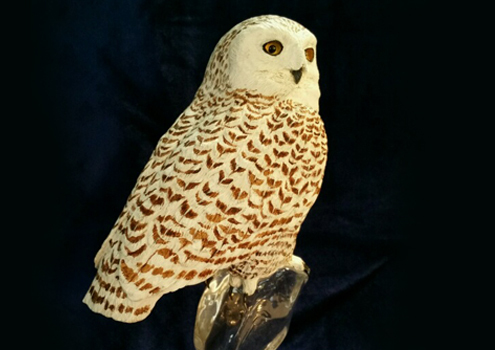 He has appeared with Edie Huggins on Channel 10 Philadelphia and has been featured in newspapers, articles, and in national woodcarving magazines. He has directed and produced two carving videos, one on a Chikadee, the other on a Baltimore Oriole. Many of his pieces of art are in private collections, Two reside with Paul Stankerd, World renown Glass Artist (Paper weight flame-worker). He recently illustrated a book for Bruce Daniels, a world renown horse shoe farrier. The book is called, “Just Another Day on the Farm”. Mike Wierski is a retired Army Veteran and Civil Servant, former Art & History Teacher, and Coach. 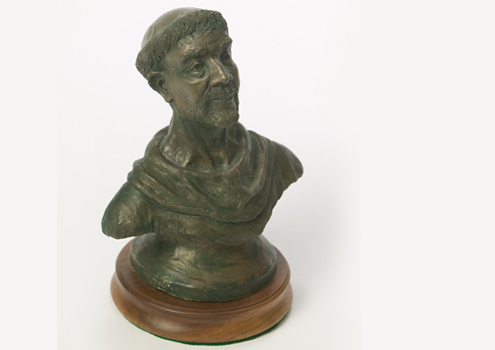 He is a self-taught sculptor and painter working in clay, wood, and oils for the past 40 years. Since retiring, he substituted in several school districts, as well as, coached football and baseball at the High School Level. Travel, photography, and family remain important interests. This is his first show in several years. “Carve & Cast” is on view through July 30th, 2017.